San Diego Self Storage, once again, sponsored ten Military Families through the Bells of Freedom program. 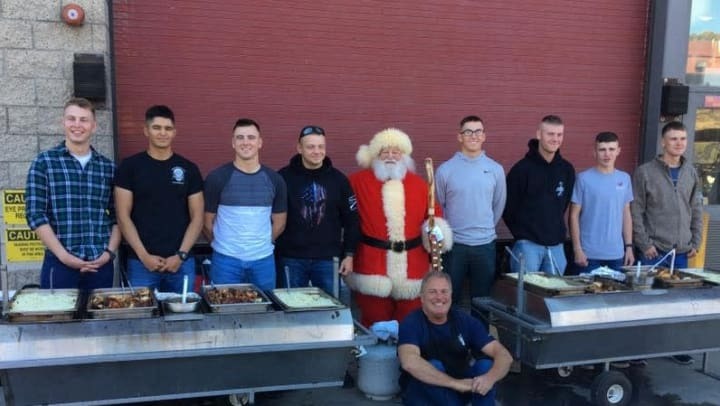 On Sunday, December 2nd, eight San Diego Self Storage employees joined the caravan to Camp Pendleton to deliver the gifts we collected to the families and enjoy lunch with them. Through the combined efforts of all the donors and sponsors, the program was able to host more than 90 Marine and Navy families of the AAS, Amphibious 3D, 11th MEU, Combat Logistics 11 and Headquarters and Support battalions. From the loading area to our caravan of motorcycles, UPS Semi's, Antique Automobiles and more than 70 private vehicles, all worked in perfect harmony to bring the Holidays to Camp Pendleton and our active duty enlisted. It's been a rewarding experience for all, and one we are certain to participate in again this in 2019.